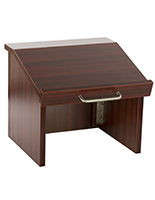 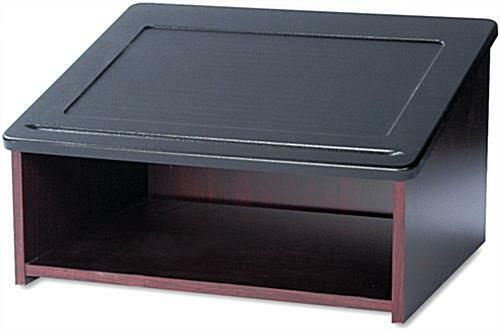 These mahogany tabletop lecterns are made of recycled wood and feature a dark finish. 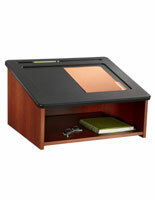 The hardwood podiums feature an angled reading surface with a recessed area for holding notes. 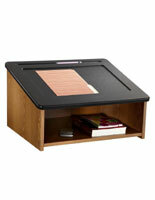 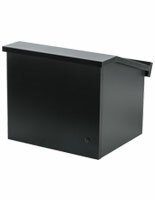 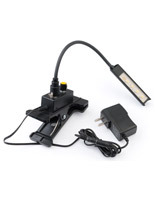 The tabletop lecterns also offer an open storage shelf that measures 21.4" x 18". 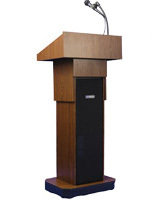 The wood pulpits with a black reading surface are more mobile than floor-standing fixtures and can be moved from room to room. 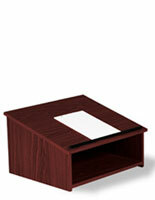 The lecterns with storage for notes are ideal for offices, churches and schools as an economical presentation stand. 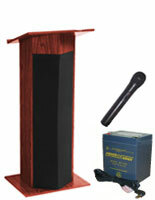 The hardwood podiums are also available with a cherry or oak finish.